UK, 1953, 88 minutes, Black and white. Anthony Steel, Jack Warner, Robert Beatty, Guy Middleton. 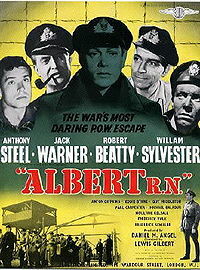 This film reminds us of how popular prisoner of war stories were in the fifties. There were many tributes to the prisoners of war in the German camps and the escapes and escape attempts. The Colditz Story, The Wooden Horse, were very good examples of this kind. Albert R.N. is distinguished by the humorous touch of the men creating a dummy who was to take the place of the men who escaped. Anthony Steel, the hero, was the hero of a number of these films including The Wooden Horse. Direction is by Lewis Gilbert who made so many action and war films and tributes during the fifties for example Carve Her Name with Pride, Sink the Bismarck. He was to return to this theme in the seventies with Operation Daybreak - between making several of the spectacular James Bond Roger Moore films of that period. Interesting historically and entertaining in its way. 1. How good a war film was this? Its particular qualities? The type of response it was asking audiences? In the fifties, now? 2. How conventional a war film was it? the portrait of the British, Americans, Canadians? The portrait of the Germans? sympathetic and fearful? The portrait of the camp and morale? The various situations, especially of tunnels, meetings, 'map', British humour? Did the film have something more than its conventions? 3. How interesting is the film now as the British portraying themselves after the war and their memories of war? The image of nobility? The necessity of escaping and harassing Germans? Was this the reality of war and prison camps? or has this been romanticised? 4. How interesting was the plot? The ingenious nature of and the elaboration of the plot and its being carried out? Albert himself and the sequences portraying him as being put together and taken apart, being tested on people? How dangerous was the project? How did this make it interesting for the audiences? 5. The presentation of the Germans? The official who wanted the watch? the deal that he made with the Canadian, shooting him, the irony of his own death? 6. How conventional a British hero was Albert? The background story of his girlfriend, the years in the camp, his art work? the conception of Albert and the execution, his being told too British heroism, the need to kill for freedom? 7. How interesting were the minor characters in	the camp? Maddox and his	role of authority, the Irishman bearing about his wife and he Canadian, the ironic types? The varying types were	they too conventional and caricatures? The portrait of British attitudes in such situations? 8. The presentation of Texas and attitude, the contract with the English, his desperate need to admit his foolishness in trusting the Germans, the pathos of his death? 9. Comment on the way the escape sequences were filmed. suspenseful climax for the film? 11. What values did this film stand for when it was made? Now important are they now? Does the film communicate them now?